Talking about alternatives to plastics is, in a sense, looking at the problem in reverse. It is the plastics themselves which are the alternatives -- alternatives to traditional materials which have been used in our kitchens and homes for centuries. The nice thing about switching back to traditional materials is the discovery that they are a lot nicer to look at and use. Plastic has always been the cheap alternative, and it almost always looks cheaper too. All these alternatives are food-safe, BPA-free, phthalates-free and PVC-free. Plastic alternative #1 – Glass. Glass is a remarkably useful material in any kitchen, and can be used not only for drinking glasses, but also for mixing bowls, food storage, cooking both on top of the stove and in the oven, microwaving and more. Glass is also a good choice for baby bottles. Plastic alternative #2 – Wood. Wood is a wonderful material. You can use as an alternative to plastic chopping boards, salad bowls, utensils and storage containers. In addition to being safe, wood is a great deal more pleasing esthetically. It is warm, natural and looks good in most kitchens and dining areas. And you can look beyond traditional woods and use bamboo, which is now being used in all kinds of imaginative ways. Plastic alternative #3 – Stainless Steel. Stainless steel is not only a safe and long-lasting material to use for your pots and pans, but can also be your choice for mixing bowls and kitchen utensils. You can also opt for steel when it comes to storing coffee, rice, pastas and other uncooked foods. The only time you will absolutely need a different and safe alternative is when you are cooking with your microwave. Plastic alternative #4 – Ceramics. In addition to its normal use in tableware, ceramics are great for mixing bowls, salad bowls, serving dishes and storage containers. With ceramics, unlike steel, wood and glass, you are not limited in the colors you can choose. Whatever your kitchen decor, there is a glaze you can choose to match. Plastic alternative #5 – Silicone. Silicone is a wonderful material, because it looks and feels like a flexible plastic. But it isn’t plastic at all. Silicones are largely inert, non-toxic, silicon polymers which are heat-resistant, nonstick, and rubber-like. In the kitchen you’ll find silicone used to make spatulas, baking mats, baking cups, ice trays, heat-resistant oven gloves and more. Some steel implements are “dipped” in silicone, giving you a surface that grips better. Plastic alternative #6 – Bamboo. Bamboo is a remarkably flexible material and can be used in all kinds of ways. 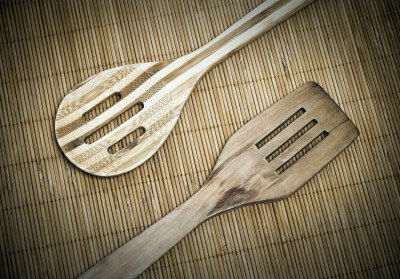 In the kitchen we are used to seeing bamboo being used for utensils and occasionally cutting boards and bowls. But did you know what bamboo can also be processed and used in many other ways? As an example, you can get rid of those polystyrene disposable plates and instead use bamboo plates. They are not solid bamboo, but are made from molded bamboo fiber.